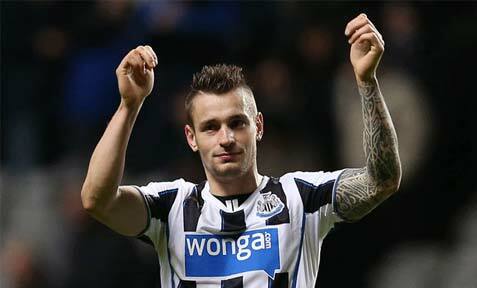 Midterm Report: How much has Mathieu Debuchy improved? Words by Kevin Doocey on January 20, 2014 . Mathieu Debuchy was a player that Newcastle had tried to bring to St. James’ Park before the 2012 European Championship. Just a few minutes into the illustrious footballing tournament is was easy to see why. In the right-back position for France Mathieu was quick, well versed tactically and loved to get forward from right-back to aid his teammates — an ideal candidate for the Premier League. Against England Debuchy performed admirably and his good form continued throughout the rest of the tournament until the French were eliminated in the last 16 by eventual champions, Spain. As Newcastle struggled for form in the league throughout the second half of 2012, immediate action was taken to rectify a leaky defence. Debuchy was courted and after a long, drawn out transfer process all speculation was put to bed when the man signed the dotted line in Jauary 2013 to complete a £5m move. The question is: how has it fared out for him so far? Below is a quick summary of Debuchy’s efforts so far, and what we make of him here at Tyne Time. Story so far: When Mathieu first arrived at Newcastle you could see - alike many of the other French players in the squad bar Yohan Cabaye - that it was going to take time for him to adapt to English football. The 28 year old put in a few horrid performances for the Magpies in his first season, but 2013⁄14 has brought about the real Debuchy and he has excelled as a full-back. His positioning, tackling both on the deck and aerially, and general reading of the game has seen him become of Newcastle’s most influential players. Some very solid performances including his efforts against Manchester United in that famous win at Old Trafford marked a very impressive first half of a season and he even grabbed a goal against rivals Sunderland, although it turned out to be in vain. Despite the good form, the Frenchman is still a liability at times and that was highlighted with a daft sending off against West Brom in December. Moment of the season: His performance against Chelsea in our 2-0 victory over Jose Mourinho’s side just about trumps his efforts against David Moyes’ men, for me. His general all round game was superb that day against the Blues and merited the Man of the Match award. Hopefully there are many more fine outings to come for the ex-Lille man. So… there is my quick review of Mathieu Debuchy so far this season. This ‘Midterm Report’ series will continue tomorrow when I take a look at Mike Williamson and Fabricio Coloccini. What are your thoughts on the performances of Debuchy this season? Comments in the section provided below please, and make sure you give me a follow on Twitter @KevinDoocey and like Tyne Time’s Facebook page!